Sheldon Silver, the former long-serving speaker of the New York State Assembly and a statewide powerhouse lost his job, his law practice, his political life and possibly his freedom over corruption charges in January. His sins according to the federal prosecutor: using his position for personal gain by covertly receiving jumbo payments from a law firm that specialized in lobbying for cuts in New York City real-estate taxes. The firm was founded by his former Assembly counsel, and its client, in turn, was one of the state’s single-largest political donors. Politics as usual? Not really. Silver’s real crime was making it patently obvious he was engaging in a quid pro quo arrangement, which is how corruption in office is singularly judged today, thanks to a series of Supreme Court rulings dating back to 1974. Scattered news reports say the dirt on the speaker came via a string of legislators ratting Silver out in return for reduced corruption charges against themselves. Others say the law firm partners themselves rolled over on Silver. “Shelley,” as he was known before his fall from grace, is just the most recent example of a public figure to resign or be ousted over allegations that he used his public office to help private friends and line his own pockets. If true, he fits the narrowest categories of corruption as understood by the contemporary U.S. Supreme Court: that a direct and palpable quid pro quo (literally: getting something for something) operates. For Zephyr Teachout, the Fordham University law professor and Democratic candidate for governor in 2014 who on a shoestring budget took some 35 percent of the vote away from the state’s neoliberal prince in the governor’s mansion, that definition is too constricted. In Corruption in America: From Benjamin Franklin’s Snuff Box to Citizens United, she demonstrates how that conceit short-circuits what the nation’s founding fathers had in mind when they talked about public office and democratic involvement in governing. It’s not just selling votes or a blatant one-hand-washes-the other or a favor to the spouse’s ne’er-do-well brother-in-law that are dangerous. It includes the unvoiced but no less operational understanding that big campaign contributions (it cost some $2 million on average to be reelected to the U.S. House of Representatives; chump change compared to the Senate, where the average is $10 million) in effect buy favorable attention for desired legislation as well as privileged access to elected officials through professional lobbyists, themselves often former public office holders. Corruption never had a clear and uniform legal definition, Teachout insists. With state courts ruling differently and the High Court itself imprecise if not contradictory, the vagueness ended when the right-wing-dominated U.S. Supreme Court, in three decisions beginning in 1975, recognized only blatant quid pro quo as a corrupt public practice. Paying a lobbyist $5 million dollars to get an incumbent to vote a corporation’s needs is okay if there’s no demonstrable reciprocity. The court’s unravelling of how corruption works in practice comes from three court cases, starting in 1976. In Buckley v. Valeo, the court struck down federal spending limits by campaigns as an abridgement of First Amendment rights, but sustained rules limiting campaign contributions from individual sources, strict discloser rules on where the money comes from and public funding of elections was halal. In 2010 an even more right-wing court majority found in Citizens United v. Federal Election Commission (FEC) not only that corporations were now to be considered as people with free speech rights, but that in the court’s opinion ingratiation and privileged access to pols was no more than “donors trying to influence policy through campaign contributions, unless the donors were crass.” It said favoritism and influence were the inevitable part of responsive government, hence of politics. After a thorough and almost agonizingly detailed grand tour of dozens of often conflicting federal and state court decisions differing on the precise legal meaning of “corruption,” Teachout ends up with a book that should become required reading in constitutional law classes. Caveat emptor: given the wealth of detail underscoring her critique, it’s no beach reading. Her style happily is fine; in places ripping. Academics should take note. 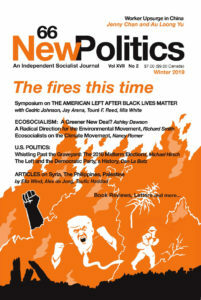 Michael Hirsch is on the editorial board of New Politics. This article first appeared in The Indypendent, April 9, 2015, Issue #205.